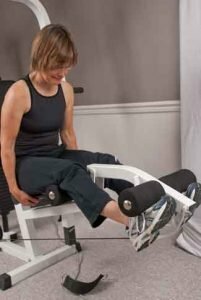 In this blog, I will cover ten osteoporosis exercise contraindications (also known as osteoporosis exercises to avoid) that should not be a part of your exercise program. I will also briefly discuss yoga exercises to avoid with osteoporosis. Research and clinical studies have shown that flexion of the osteoporotic spine, especially in situations where force is applied, can lead to fractures of the vertebrae. Unfortunately, this scientific fact is not well known within the fitness community and, as a result, you will find Personal Trainers (and some medical professionals!) in books and magazines encouraging exercises (like traditional crunches) that cause flexion and potentially put you at risk of a fracture. The osteoporosis exercises to avoid include those you do with a machine and those you do without one. Sadly, many of these osteoporosis exercises to avoid are employed by personal trainers and during exercise classes. Do not feel obligated to do them because a personal trainer or class leader indicates you should. Most fitness professionals do not know how to modify exercises programs for people with osteoporosis. It is up to you to take care of your bone health. 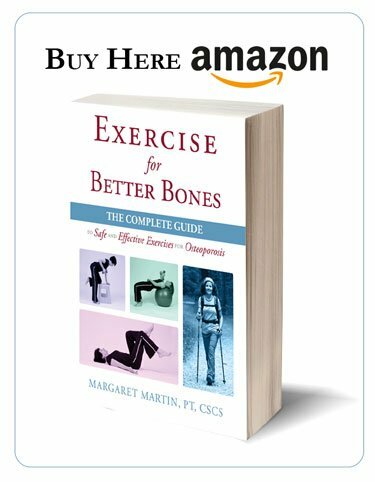 The book Exercise for Better Bones has a comprehensive list of osteoporosis exercises to avoid (or modify) with accompanying descriptions and photo illustrations. It also has (and this is important) exercises you should do if you have osteoporosis based on your activity level and risk of fracture. 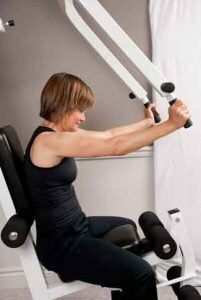 I frequently have clients, with known diagnosis of osteoporosis, come to my clinic for a bone-friendly exercise program once they realize that the Personal Trainer they are using at a gym has not taken into consideration their specific health needs when assigning them an exercise program. They are surprised (and frequently shocked) when they learn that the exercises that they have been doing, under the guidance of a Personal Trainer, are osteoporosis exercises not to do and have increased their risk of a fracture. 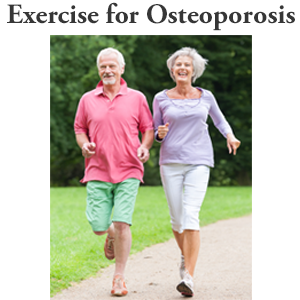 I tell them that it is important for them, given their medical condition, that their exercise program (and all their movement patterns) needs to consider osteoporosis exercise contraindications. Flexion and the combinations of flexion and rotation are not recommended for people with osteopenia or osteoporosis. Many of the exercises to avoid with osteoporosis, covered in this blog, encourage either flexion or rotation (or both). Many of these exercises have been with us for years. You have probably done a number of them in your past (hopefully for the last time!). You may be surprised by some of the exercises I am asking you not to do. Let’s start with the most popular of exercises: the traditional crunch or sit-up – used by many people to build their abs. The following is a detailed description of the osteoporosis exercises not to do or modify. Traditional “crunches” (also known as sit-ups) are popular with most exercise programs for development and strengthening of the abdominal muscles. There are many variations of the crunch. The illustrations to the right demonstrate two of the many variations. Due to the risk associated with vertebral fractures, this exercise is not advised for people with low bone density or osteoporosis. The crunch is one of a number of osteoporosis exercise contraindications and is one of those osteoporosis exercises to avoid. There are many other exercises you can do to strengthen your abdominal muscles that are safe and do not place your spine at risk. 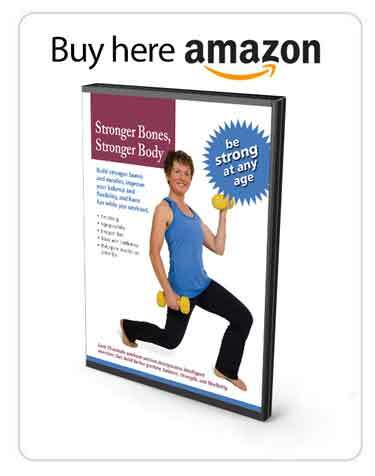 These are covered in the Strength Exercises section of the Exercise for Better Bones program. You can also refer to my book, Strengthen Your Core, available in both Kindle and print formats, for a complete and safe program to strengthen your core. When using gym equipment, most women have to adjust their body position to accommodate the machines. The Chest Fly machine may cause undue stress on the vertebrae, possibly risking a fracture for people diagnosed with osteoporosis. I recommend you approach this exercise with caution. When using gym equipment, this exercise (like its sister exercise, the Chest Fly) causes undue stress on the vertebrae, possibly risking a fracture for people with low bone density or osteoporosis. I recommend that you avoid this exercise and that you avoid using this piece of gym equipment altogether unless you can keep your spine in perfect alignment. This exercise encourages a “slouched” posture, potentially risking a fracture of the vertebrae for people with osteoporosis. If you are able to perform this exercise without the forward lean (the slouch position), then you should be okay with the exercise. In my experience, most individuals find it difficult to maintain their posture while repeatedly doing this exercise and over time, they gravitate back to the slouch position. Doing a lat pull down behind your head, as illustrated in the photo on the right, places excess stress on your shoulders, neck, and spine. I strongly advise that you do not do this exercise this way. The lat pull down behind the head is one of a number of osteoporosis exercise contraindications and is one of those osteoporosis exercises to avoid. A lat pull down, when done correctly, is an excellent exercise. The following are some simple instructions to follow for good “lat pull down” form. The bar should be pulled down in front of you, just below your chin. You should keep your breastbone high and tuck your shoulder blades towards your pockets on the back of your pants as your elbows descend. This exercise, when done incorrectly, encourages a “slouched” posture, potentially risking a fracture to the vertebrae for people with osteoporosis. This slouch position is illustrated in the photo to the immediate right. Note the curvature of the upper back caused by the model leaning forward to follow the cord. This position should to be avoided. This exercise can be performed safely when the person assumes a better posture – as illustrated in the picture to the immediate right. Note that the model has kept her posture straight and aligned. There is no forward lean or slouch. The challenge for most people will be to maintain a straight posture when they pull, pick up, and return the pulley to the rack. If you decide that this an exercise you want to keep in your routine, make sure that you maintain your posture throughout the execution of this exercise. The toe touch with a twist is often the staple flexibility exercise in many Personal Training routines. The problem with this exercise is that it encourages a twist and bend in the spine, potentially risking a fracture to the vertebrae for people with osteoporosis. This exercise is high up on the list of osteoporosis exercises to avoid because it combines both flexion and rotation. There is no way to modify the exercise to make it safe for you. This one is best avoided altogether. This stretch (and its variations) encourages flexion, potentially risking vertebral fracture for people diagnosed with osteoporosis. It is one of the more “popular” osteoporosis exercises to avoid. The two photos illustrate common variations of this exercise. The traditional hamstring stretch is frequently used to increase flexibility. Note that in the demonstrations, the model has a curvature of the back caused by the forward lean. This curvature or flexion needs to be avoided by people with low bone density and osteoporosis and is one of those osteoporosis exercises to avoid. In Flexibility section of the Exercise for Better Bones program, there are excellent and very effective hamstring stretches that do not put your spine at risk. I suggest you avoid the traditional hamstring stretch demonstrated on this page and instead use the exercises in the Flexibility section of the Exercise for Better Bones program. The traditional hamstring stretch is one of a number of osteoporosis exercise contraindications and is one of those exercises to avoid with osteoporosis. This back stretch exercise position, illustrated in the photo, encourages flexion of the spine with a lot of loading – potentially risking vertebrae fracture for people with osteoporosis. Since there are no modifications that can be made to this exercise to address its shortcomings, the exercise is best avoided. The back stretch is one of a number of osteoporosis exercise contraindications and is one of those osteoporosis exercises to avoid. Good posture is important to maintain throughout your cardio routine. 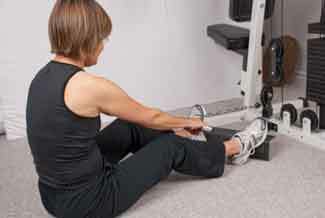 Osteoporosis exercise contraindications can happen while you perform weight bearing exercises. Remember that even while doing your cardiovascular (or weight bearing) exercises to sure that you maintain proper posture and avoid positions that cause flexion of the spine. 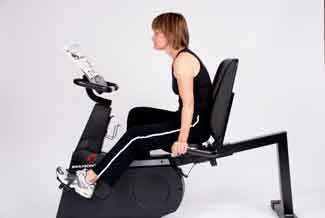 In the photo to the right, the model is deliberately slouching forward as she is using the cycling machine. She should change her seat position so that she maintains postural alignment while using the machine. I frequently encounter very motivated people who, without the guidance of a trained professional, select exercises that increase their risk of fracture instead of decreasing the risk. 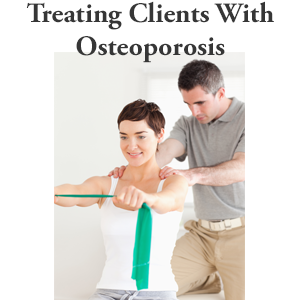 For example, I recently had two male clients who had been diagnosed with osteoporosis in the last year. Both of these motivated and well-intentioned men started exercise programs because of the diagnosis. Unfortunately, the self-prescribed exercise programs they were following were increasing their fracture risk! Using machines that encourage flexion. This was especially true with the use of the preacher curl bench. This device forces your upper back into a rounded (or flexed) posture. At most gyms, this bench is the starting point for both the bicep curl and the tricep extension. The preacher curl bench forces you into a slouched position – a posture that is associated with increased compression fractures of the spine. Crunches. I strongly advise people with low bone density not to do this exercise because it places the subject in a flexed position. Crunches are frequently done either on a mat or on a machine and neither of these variations is safe. This exercise is frequently used by people to build abdominal strength. The MelioGuide Exercise for Better Bones Program has safer alternative exercises that build strength appropriate for people with low bone density. Standing and seated hamstring stretches. This is another popular exercise used during the flexibility phase of an exercise program. The major problem with the exercise is that it encourages flexion. This is one I suggest you avoid. Instead the MelioGuide Exercise for Better Bones Program has many safe alternative exercises for flexibility. Using a bench to do bench press. The problem with this exercise is that it is virtually impossible to safely get on and off a bench without flexing your spine. The situation is even more challenging when you perform the dumbbell bench press. The dumbbell bench requires that you hold two heavy weights as you get onto the bench. The same exercise on the floor would allow you to roll down through your side and avoid the flexed position. The MelioGuide Exercise for Better Bones Program includes a list of exercise safety tips to help you perform your exercise program in a safe fashion. Using the elliptical for cardio. The elliptical creates no ground force and, as a result, is does not challenge your joints and bones enough to stimulate bone building. It also encourages flexion of the spine when performed improperly. Note in the picture that the client is having to slouch or flex forward to reach the handles. There are many cardiovascular exercises that are safer alternatives to the elliptical. In the MelioGuide Exercise for Better Bones Program I suggest a variety of safe cardio activities based on your activity level and fracture risk. After consulting with the two gentlemen, I made the following modifications to their exercise programs to make them more effective and safe for someone with osteoporosis. If you are following a program similar to their program and have low bone density, osteopenia or osteoporosis, you should consider these modifications as well. No modifications were made to their enthusiasm and commitment! Incorporate more free weights into your routine. This allows a more functional type of lift. You are working the main muscle but also all the smaller supportive musculature. The added bonus that free weights deliver, when done with good posture, is that they allow your deep spinal muscles to kick in and help you build stronger bones in your spine (vertebra). Focus on strengthening the transverse abdominus. Other than martial artists, and competitive tennis, soccer and volleyball players, few recreational athletes need to develop their rectus abdominus. The rectus abdominus is the muscle strengthened by crunches. Your focus when it comes to abdominal strengthening should be on the transverse abdominus. This muscle is your built in corset. It wraps around your torso and attaches into the fascia that is directly connected to your spine. Training your transverse abdominus will not only eliminate the potentially dangerous crunches from your program but it will also reduce dangerous torques and shearing forces that place your spine at risk. Eliminate stretches that place you in a flexed position. Lying flat on your back to stretch your hamstrings will reduce your tendency of bending forward at the spine to touch your toes. Modify your bench press position. Executing a bench press from the floor allows you to roll down and back up in a safer manner. With guidance, the use of a burst resistant ball also allows you to execute a bench press with safer ascent and decent. Replacing a bench press with a push up has the added benefit of increased loading through your wrists. Select a safer cardio alternative. Both men would benefit more from brisk walking either outdoors on the sidewalk or trail. When the inclement weather sets in, they could use the treadmill. Individuals with osteoporosis need to practice caution when doing certain Pilates poses. Before starting a Pilates program with a new student, a qualified Pilates instructor should gather important information about the student’s physical condition and health—including if the student has, or is at risk of, low bone density or osteoporosis. If your instructor is not aware of your condition, then you should alert him or her and inquire about appropriate modifications before starting a Pilates program or session. As a general rule, students should modify their Pilates programs as they progress in age. For the student with low bone density or osteoporosis, it is critical that the student and teacher monitor the student’s spinal alignment to reduce the risk of vertebral fracture. Forward bends of all kinds should involve flexion of the hip only. Students need to maintain a normal curvature of the spine throughout the pose. Bending at the hips, rather than at any point in the spine, is essential. Pilates instructors need to be aware of the risks to clients with low bone density of forward bends that involve spinal flexion. As a Pilates practitioner or instructor, it is recommended that you modify or eliminate poses that cause negative stresses on the spine. Certain exercises, including some yoga and Pilates poses, can cause strain on the vertebrae of a person with osteoporosis — to the point where the risk of a compression fracture is quite high. As a result certain yoga and Pilates poses need to be part of the set of exercises that are considered osteoporosis exercise contraindications and one of those exercises to avoid with osteoporosis. 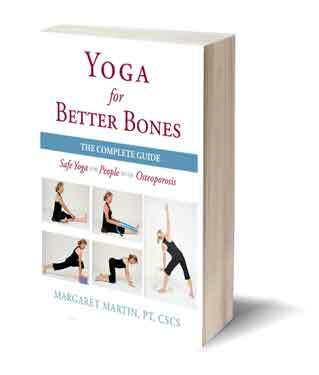 My book, Yoga for Better Bones, is about yoga exercises for osteoporosis and specifically identifies osteoporosis exercise contraindications and poses that should be modified or avoided for people with osteoporosis. I am sure that you have done some of these osteoporosis exercises to avoid at one point in your life. It is now time to leave them behind and to move onto an exercise program that builds bone strength and reduces the risk of fracture in a safe and effective way. In Exercise for Better Bones I cover, in detail osteoporosis physical therapy contraindications exercises as well as exercises you should do to that are safe and effective for your activity level and fracture risk. 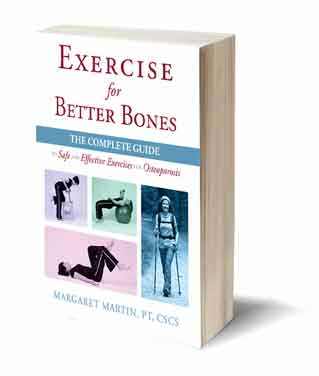 I encourage you to embark on your Exercise for Better Bones program! In this blog on osteoporosis exercise contraindications, we covered in detail osteoporosis exercises to avoid that can compromise your posture and lead to kyphosis. Such a helpful website. Thank you. This section on exercises to avoid is critical. I was doing them for years in my youth and middle years and gradually dropped them from my routines as I learned more about their negative effects. Now that I have been diagnosed with osteoporosis, I’m on the hunt for a physio in my northern BC community who can guide my exercise program. In the meantime I will be learning and practicing as much as possible from you via this website. Thank you again. Please tell me if I can do your exercises when I already have fractures. Thank you again Margaret..I did these exercises often, but delete them quickly. Especially now that I use your book and exercises on strengthening my bones. February 21, 2018 at 9:15 P.M.
Are those exercises also contraindicated for OSTEOPENIA of spine? Or should I keep doing them to MAINTAIN flexibility & Strength? Anita, Great question! The thing is that the diagnosis of osteopenia and osteoporosis is only based on your bone mineral density scores. Your bone quality is not taken into account. To be on the safe side I would find safer, more intelligent ways to stretch your hamstrings, strengthen you quads, etc all are detailed in my books. Although you and other professionals recommend Tai Chi for individuals with osteoporosis, I have a concern with a spine turning foundation from the Taoist Tai Chi tradition that is also incorporated into many movements of the set. The object of the movement is to turn the shoulders before the hips in a spiraling movement of the torso as you transfer weight forward. For someone with significant osteoporosis of the lumbar spine I am concerned about doing this move. Otherwise, I do love my Tai Chi. Any thoughts about this movement? I have been using your book of exercises for the past year and thank you for them. The amount of rotation you mention is not so great that you need to be concerned. Having said that, if it does not feel right for you or does concern you then modify it so that you can feel safe and at peace with your practice. Of bigger concern to me is the “Needle at the Sea Bottom”. Be sure to stick out your bottom and hinge from your hip when doing this move. Thank you for your support in purchasing my book. Wishing you many happy hours of TaiChi practice. What about running? I’m recovering from a stress fracture of my large toe. I’m a fifty year old woman. A dexa scan revealed osteopenia. My doctor says I can continue running after it heals. I found your article while searching for safe exercises during my recovery. After too! 🙂 What confuse me though is some articles like this one – says not to run. Others like Mayo and WebMD say its OK. Is it OK to run with osteopenia but not with osteoporosis? Is cycling ok? I’m an avid cyclist and was just told I have osteoporosis of the lumbar and osteopaninic of the hips. I can’t imagine giving it up. Hi Wendy, Cycling is an excellent form of cardiovascular exercise that is easy on your hips and knees. Just do not expect it to help your bones. Make time in your weekly exercise routine to do bone building strength and weight bearing exercises. What is your opinion of trap bar deadlifts and prowler exercises (specifically pushing) for someone who is strong and fairly well-conditioned who has been diagnosed with osteoporosis? I will comment on the exercises you ask me about but I want to be sure that you are not working out in a low energy state. There is a condition referred to as the athlete triad syndrome. It is common in lean athletes such as female body builders, dancers, gymnast and distance runners. In an effort to reduce their body fat so much they develop menstrual dysfunction (amenorrhoea/oligomenorrhoea). The third leg of the triad is low bone density. If this is the cause for your osteoporosis I strongly encourage you to seek medical help. Being diagnosed with osteoporosis is like being painted with a very broad brush. It does not give me any idea of how low your bone density is. Nor what your bone quality is like (previous fractures, your posture, medication history, past eating disorders, age of menarchy etc. ) all are part of my decision making when someone asks me whether or not they can do particular exercises. Done from the higher position with a straight back I might be comfortable with it (as in the blog below). I would not be comfortable with you turning the sled. The deadlift was used in the LIFTMOR study with osteoporotic woman. As mentioned in the study all lifts were highly supervised. I recently spoke to the lead researcher in the LIFTMOR and she said there has only been one vertebral fracture to date. It occurred after the publication of the study results. Any advise on excercise like single leg slide and single leg circles. These are Pilates based. what I see despite what the instructor is saying is that the person demonstrating is straining her low back with every “circle” or leg drop. You can see this if you look at the arch in her low back as she moves her leg. Placing a rolled towel in arch of the lower back is one way to get tactile feedback that you are keeping your spine stable while moving the leg. Bending the opposite leg with the foot resting on the floor could also reduce the strain on the low back. So in this case it is less about the flexion strain placed on the spine and more about the shearing stresses if you are not stable enough which the model was in my opinion demonstrating. Hope this is helpful.